Stuttgart - The second generation of the B-Class car heralds a new compact class era at Mercedes-Benz in terms of both design and technology. The entire drive programme is also completely new: four-cylinder petrol and diesel engines with direct injection and turbocharging, dual clutch transmission and manual transmission. Ten new assistance systems support the driver. Future B-Class customers will benefit from this quantum leap in terms of exemplary low fuel consumption and CO2 emissions combined with driving pleasure, plenty of space and the highest standard of safety that has ever been available in this class. The compact sports tourer is available for ordering now, with delivery to customers commencing in November. Prices begin at 26,001.50 euros (incl. 19% VAT.) for the B 180 BlueEFFICIENCY. This means that the new model is being launched at the same price as its predecessor of the same name, despite marked improvements to the equipment and appointments. As a world first in the compact segment, for example, the new B-Class features COLLISION PREVENTION ASSIST as standard. This radar-based system with adaptive Brake Assist helps to reduce the danger of a rear-end collision. Other standard features include the ATTENTION ASSIST drowsiness warning system, a kneebag for the driver, four power windows, LED daytime driving lights, a six-speed manual transmission and the Audio 20 CD entertainment system with USB connection and Bluetooth. The B 180 BlueEFFICIENCY rated at 90 kW (122 hp) offers five kW more power than its predecessor, but consumes substantially less fuel. 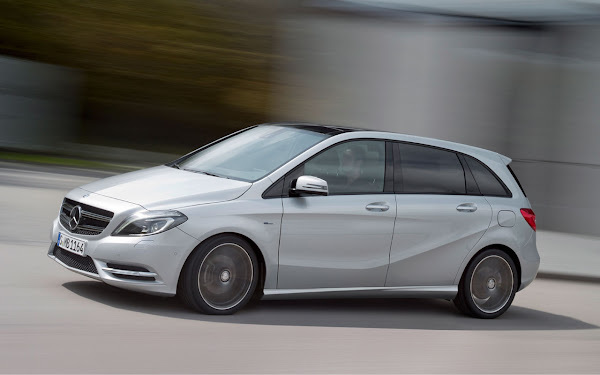 The sales start for the new B-Class marks the launch of the first model representing the new compact cars from Mercedes-Benz. "The new B-Class kicks off our offensive in the premium compact segment, which harbours vast potential for growth worldwide," explains Dr. Joachim Schmidt, Member of the Management Board of Mercedes-Benz Cars, Sales & Marketing. "With an attractive portfolio comprising five fascinating, distinctive models, we are opening up our brand to new categories of customer and once again setting new standards in safety, efficiency, comfort and aerodynamics. Our sales volume and our market share in this segment are set to rise sharply once again across all variants." 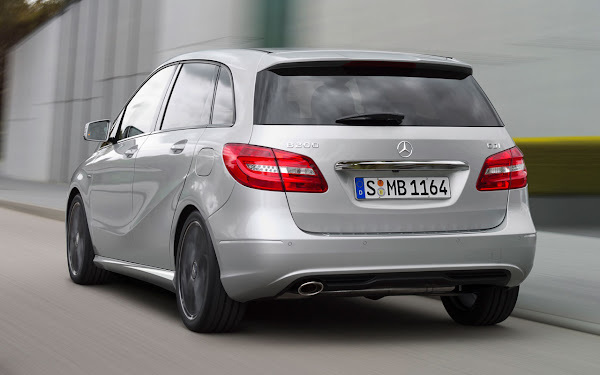 The fuel consumption of the new B-Class undercuts its predecessor by up to 21 percent. All the engines have been developed in-house. Both diesel models (B 180 CDI BlueEFFICIENCY and B 200 CDI BlueEFFICIENCY) now run on 4.4 litres per 100 km (114 and 115 g CO2/km respectively) – their predecessors required 5.2 litres per 100 km. The B 180 CDI BlueEFFICIENCY attains a CO2 value of 115 g/km with automatic transmission – an improvement of 21 percent on its predecessor (146 g/km). The petrol-engine variants have also made great strides: despite a substantial improvement in performance, the B 180 BlueEFFICIENCY and B 200 BlueEFFICIENCY now run on 5.9 litres per 100 km (137 and 138 g CO2/km respectively), undercutting their predecessors by up to twelve percent. Another premiere from Mercedes-Benz is the new 7G-DCT dual clutch transmission, which can be combined with any of the engines (2,165.80 euros). Its seven gears make it extremely versatile in adapting to engine speeds. An electric oil pump provides the transmission with start/stop capability. It shifts gear without any interruptions in tractive power and combines the comfort of an automatic with the efficiency of a manual transmission, particularly when moving off. The COLLISION PREVENTION ASSIST assistance system is able to provide a driver who may be distracted with visual and acoustic warnings and to prepare Brake Assist for precision braking. Braking is initiated as soon as the driver steps emphatically on the brake pedal. The ATTENTION ASSIST drowsiness detection system also features as standard. The PRE-SAFE® preventive occupant protection system (392.70 euros) which features in the B-Class is available for the first time in this vehicle category. Core features of PRE-SAFE® are reversible belt tensioning, the closing of side windows and sliding sunroof in case of critical lateral dynamics and adjustment of the fully electric front passenger seat to an ideal position for maximum effectiveness of the restraint systems. The B-Class protects its passengers with up to nine airbags. The standard complement comprises driver and front-passenger airbag, a kneebag for the driver, large pelvisbags incorporated in the seat to protect the chest, stomach and pelvis area and windowbags. Sidebags for the rear are optionally available (446.25 euros).